I just learned from another forum of Wolfgang's passing, very sad news. I loved his willingness to share and teach, he will be missed. I've uploaded a couple track plans, one fully stocked with cars and one without. I believe it to be the plan I will actually build and I'm looking for some heckling, err I mean input from the group. It's my fictional Silverthorne, it represents an agricultural community in a mountain valley. The Keystone Branch wanders into the mountains to the Northeast to service the mines in the Montezuma Range. (Might change the Silverthorne Tram to Montezuma Tram.) A 2 foot gauge tram is seen bringing ore to the mills on the branch. 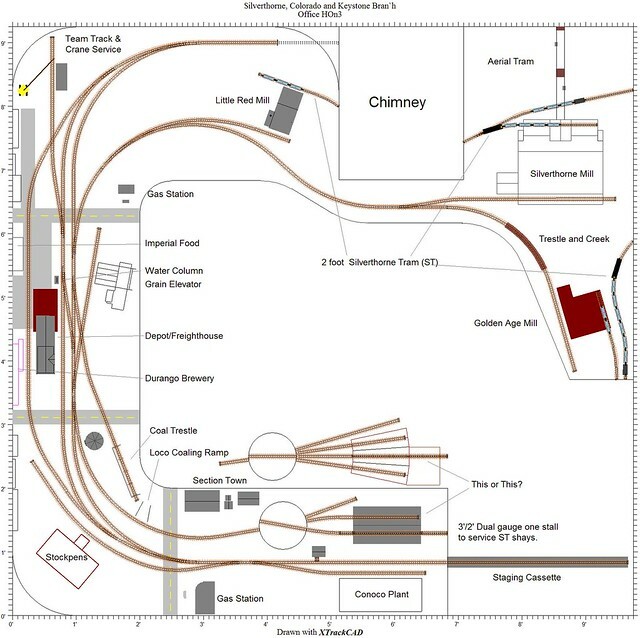 The Silverthorne Mill (maybe Montezuma Mill) is designed around Anvil Mountain Models "Modular Timber Framing System" and is very large being fed ore by both an aerial tram and the 2 footer. The engine facilities are spartan using a tractor to coal locos and drying sand in the enginehouse. The facilities service locos for the Keystone Branch and helpers to tackle the climb up Silverthorne Hill. Staging is accomplished via a cassette system and provides cars for what ammounts to a large switching layout. The 2 footer wll not operate on this iteration only being represented by small sections. The town is set in the mid 50's while the branch is a bit of a time warp going back another 20-30 years or more. Let me know what you think!! Ooh, I'm also curious if you guys like the enginhoue or roundhouse more.